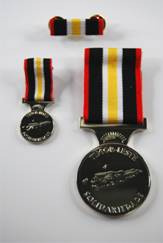 In November 2008, the Australian Government formally accepted an offer from the East Timor President HE José Ramos-Horta for Australian Defence Force Personnel to formally accept and wear the East Timor Solidarity Medal in relation to service in stability and peace operations in East Timor from 1 May 2006. Defence civilians who contributed to operations may also be eligible. The President of the Republic may consider extra-ordinary cases outside the above time-periods. Applications for extra-ordinary cases must be endorsed and submitted through the Directorate of Honours and Awards, to be considered and approved by the President of the Republic. However, service may still only count from 1 May 2006. Defence Attaché staff who are awarded the medal will only be able to accept the medal as a memento of their service. Approval will not be given for Defence Attaché staff to formally wear the medal. This week marks several significant anniversaries in the life of our youngish nation. November 11 resonates because it was the date in 1880 when bushranger Ned Kelly was hanged, ending his criminal recidivism. In 1918 the guns fell silent in Europe, ending the carnage which claimed 61,530 Australian lives but leaving grief and lost opportunities which still affect us. In 1975 John Kerr created the circumstances for all Australians to decide the fate of three-year-old Whitlam’s government, for some political carnage of a different kind. On November 14 75 years ago HMAS Sydney was sunk off Western Australia with the loss of all 645 hands, momentary carnage which this nation could then barely afford. Yet most Australians will barely recall that 25 years ago a small nation to which we owe a great debt, one with a population less than one million lost 250 souls in an afternoon of orchestrated carnage which changed its destiny and ours irrevocably. On November 12, 1991, East Timorese mourners or protesters depending on your view marched from Dili’s oldest Catholic Church, Igreja de São António de Motael to its oldest Christian cemetery, Santa Cruz. 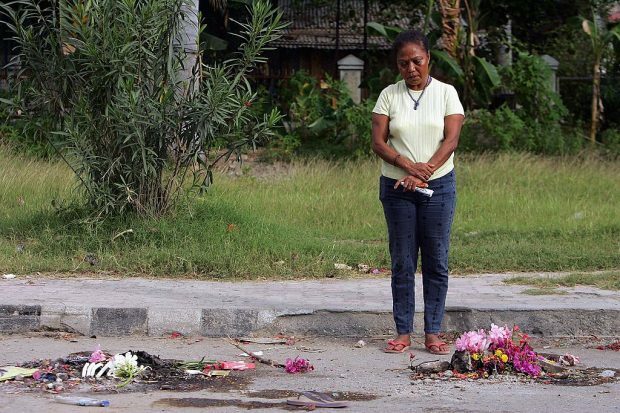 They were marking the two-week anniversary of the death of 18-year-old Sebastião Gomes, who had been dragged from the sanctuary of the church on Dili’s waterfront on October 28 by Indonesian soldiers, then shot. Several thousand mourners marched the few kilometres from the church to Santa Cruz, unfurling East Timorese flags and pro-Independence banners. It was a noisy but otherwise peaceful demonstration until it reached the cemetery, where tragedy would quickly unfold. The East Timorese, loyal allies to Australian commandos embedded in their country before then after Japanese occupation in early 1942 were invaded by Indonesian forces in December 1975. They were sacrificed to appease Indonesian expansionism by a sad confluence of political events. Portugal, the colonising power since the sixteenth century, was wracked by a 1974 military coup which led to it abandoning its colonies. Indonesia seized the opportunity to invade East Timor by military coup-de-main. Both the Whitlam and Frazer governments were silently compliant in this invasion, which during the following 25-year Indonesian occupation may have cost more than 200,000 East Timorese lives. Political divided but with a common goal of an independent East Timor, armed rebels of the rival FALANTIL and FRETILIN movements waged constant war against the Indonesian occupiers from jungle hideouts. Indonesia responded brutally, using its military superiority to rain napalm on resisting villages, or to massacre or “disappear” whole populations. One so killed was Celestino dos Anjos and his daughter-in-law Hare Kaik, the pregnant wife of resistance leader Virgilio dos Anjos. Celestino had been trained in Australian and after parachuting back into Timor with the 2/4th Independent Company, the only one of his countrymen to do so, remained a loyal Australia ally behind Japanese lines. On September 27, 1983, in retaliation for Virgilio dos Angos’ resistance activities, Indonesian troops directed by General Benny Murtani massacred hundreds of villagers in the Kraras district. Celestino dos Anjos and Hare Kaik were forced to dig their own grave before being shot. They were just two of too many East Timorese abandoned by Australian political pragmatism. In October 1991 a delegation from the Portuguese parliament and UN United Nations Special Rapporteur for Human Rights on Torture was scheduled to visit East Timor. The Indonesians objected to an Australian journalist Jill Jolliffe accompanying the delegation. Portugal then cancelled the visit causing tensions in Dili to escalate and pro-independence supporters to seek sanctuary in the Igreja de São António de Motael. Scuffles broke out between pro-independence supporters and integrationists in which two people were killed, including Sebastião Gomes. When the mourners arrived at Santa Crux a fortnight later on November 12, more scuffles erupted in which it was alleged an Indonesian major was stabbed. There is a narrow road separating Santa Cruz cemetery and a Muslim cemetery established after the Indonesian occupation. About 200 Indonesian troops lined up along the fence to the Muslim cemetery facing the protesting mourners directly opposite, a distance of a few metres. After the confrontation with the major, the Indonesians opened fire at the hundreds of mostly young mourners lined up along and on top of the Santa Cruz fence. They were unaware the moment was being filmed by British journalist Max Stahl. He recorded the panic and carnage as East Timorese, mostly students attempted to flee the scene. Although the exact number is unknown approximately 250 people including New Zealand student Kamal Bamadhaj were killed. An unrepentant Indonesian army removed many bodies, burying them in unmarked graves. They also “disappeared” wounded from hospitals. Bodies are still being discovered and recovered, and the stories being displayed in Dili’s Resistance Museum. The Santa Cruz massacre alerted the world to Indonesia’s brutality in East Timor, ultimately creating the circumstances in which an international military force led by current governor-general Sir Peter Cosgrove was able to free them from occupation. Santa Cruz’s martyrs paid a terrible price though 25 years later a vibrant, recovering independent sovereign nation, Timor-Leste, is their legacy. 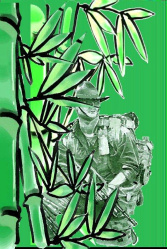 Ross Eastgate is a military historian, writer and columnist with The Townsville Bulletin. He is a graduate of the Royal Military College Duntroon, a veteran of service in PNG, the Middle East and East Timor, and a long-term RSL member. Ross recently returned to East Timor with Timor Awakening, an initiative of Veterans’ Care and RSL Queensland.